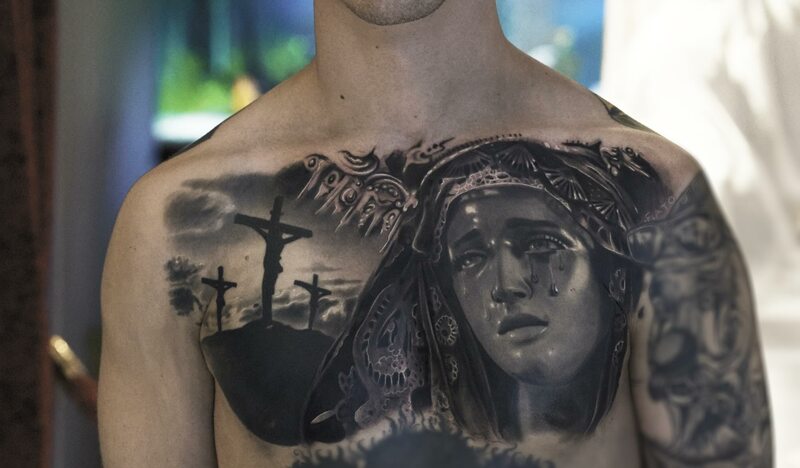 Inspired by classical Italian art and music, Silvano Fiato channels centuries of history into his hyperrealistic tattoos. His Eternal Tattoo Studio in Genoa evokes a Renaissance salon, combining a lofty cultural air with the raw mechanical inking of skin. An artist from a young age, Fiato attended an art institute to hone his skills. 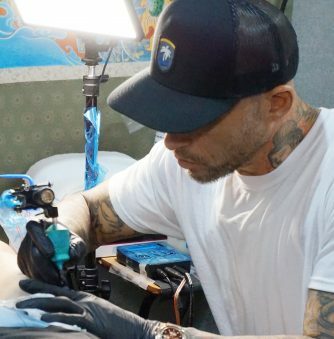 Early on, he was drawn to tattooing over drawing or painting, and he hasn’t looked back since. His specialty is hyperrealism, with meticulously rendered images ranging across the cultural spectrum from movies to music to religious icons, portraits of people and pets, statues, skulls, day of the dead faces. He rarely uses color, relying on black and gray for shading and nuance, creating a perfect balance of light and shadow. 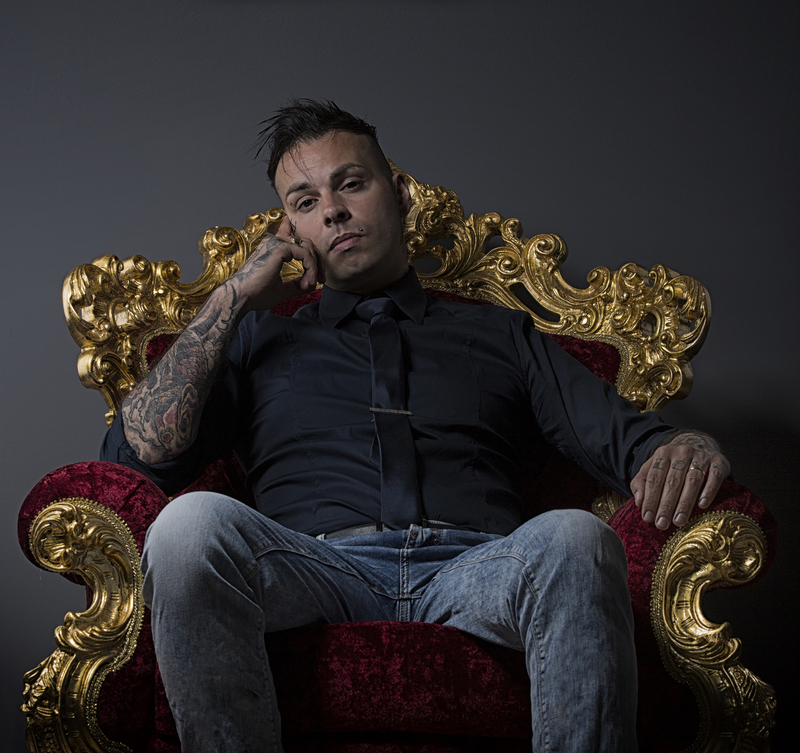 Fiato, now 34, has had his own studio for more than 10 years, and it’s booked months in advance, with hundreds of requests coming in daily. He’s passionate about his work and seems to have boundless energy. 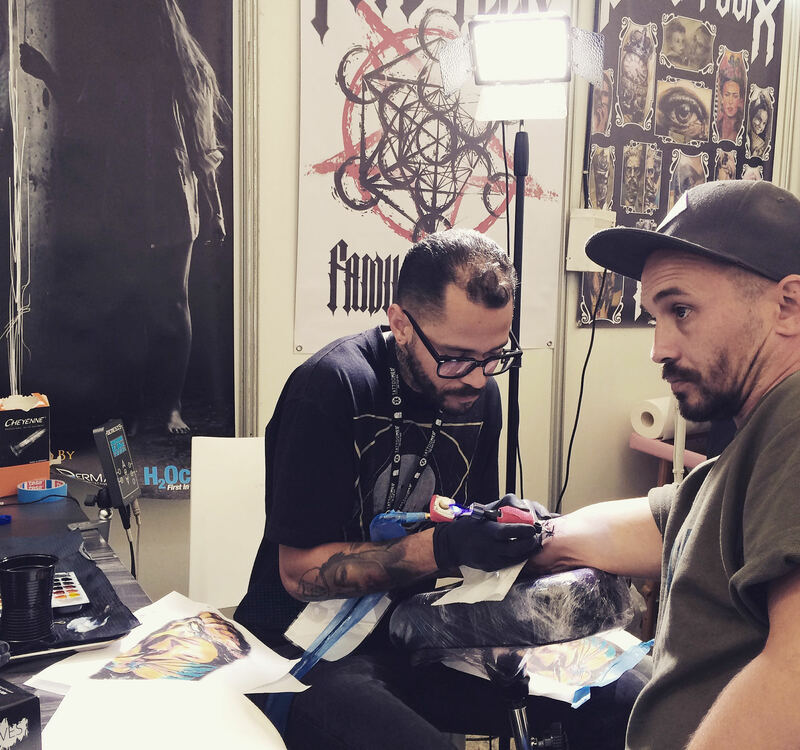 Just after the Milan Tattoo Convention in early February, Fiato took some time from his busy schedule to answer a few questions. 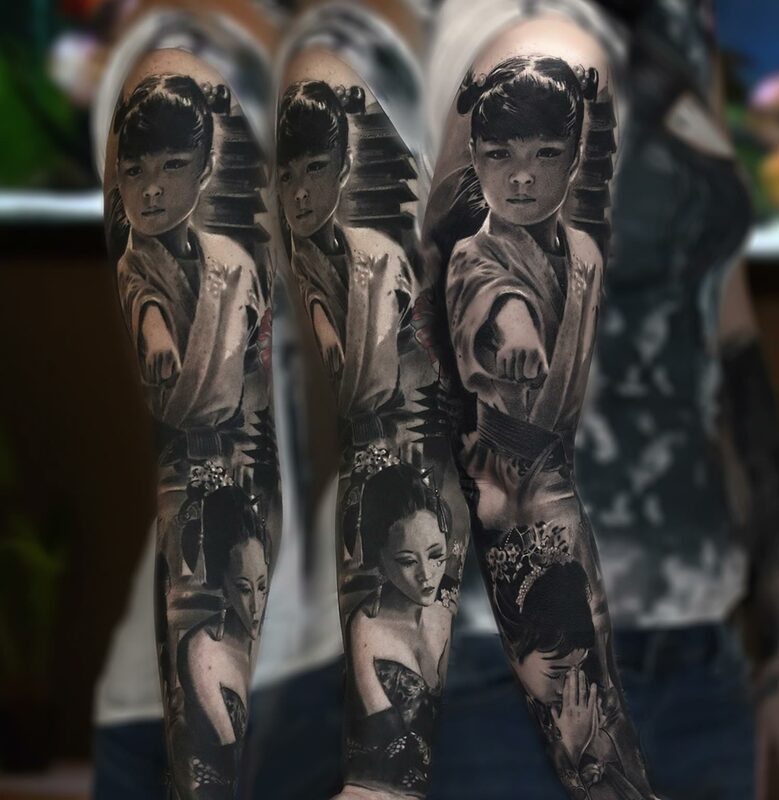 Mastery of shading is apparent in every millimeter of this sleeve tattoo. 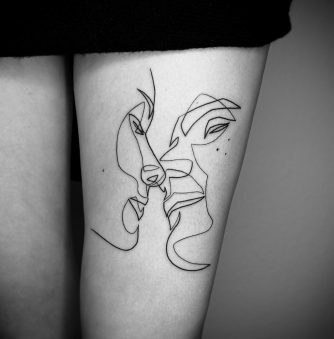 What was the thing that made you say, “Yes, tattooing is for me!” Was there a moment, an experience, an epiphany? Since childhood I always loved drawing, painting, and art in general. My grandfather had many tattoos and [they] have always fascinated me so much. 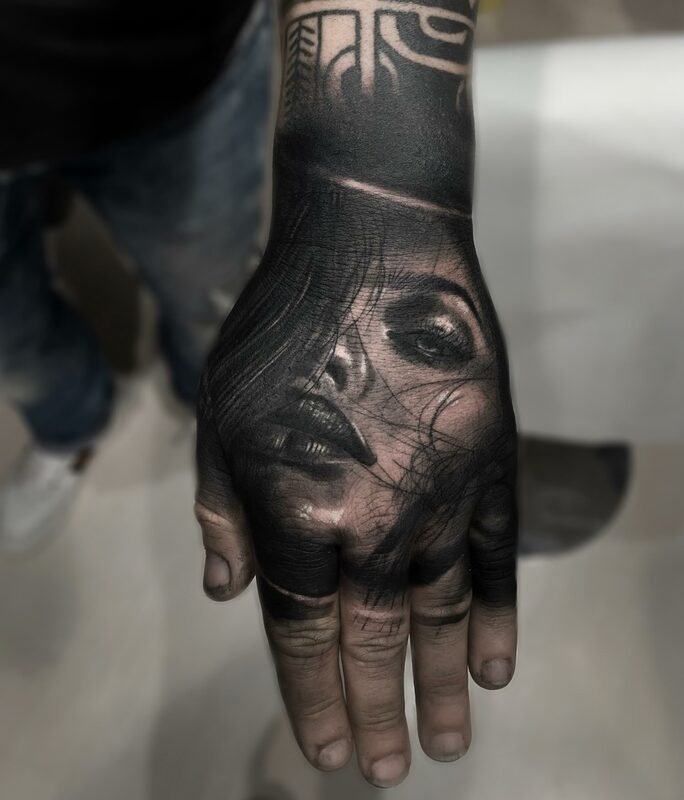 When I was 18 I discovered, in a tattoo magazine, some realistic pieces of Robert Hernandez and I finally realized that what I had always done on paper, it was possible to do on skin. It was from that day that I decided, with absolute certainty, what I wanted to do in life. I committed all my strength and with a thousand sacrifices I managed, 11 years ago, to open my own studio. 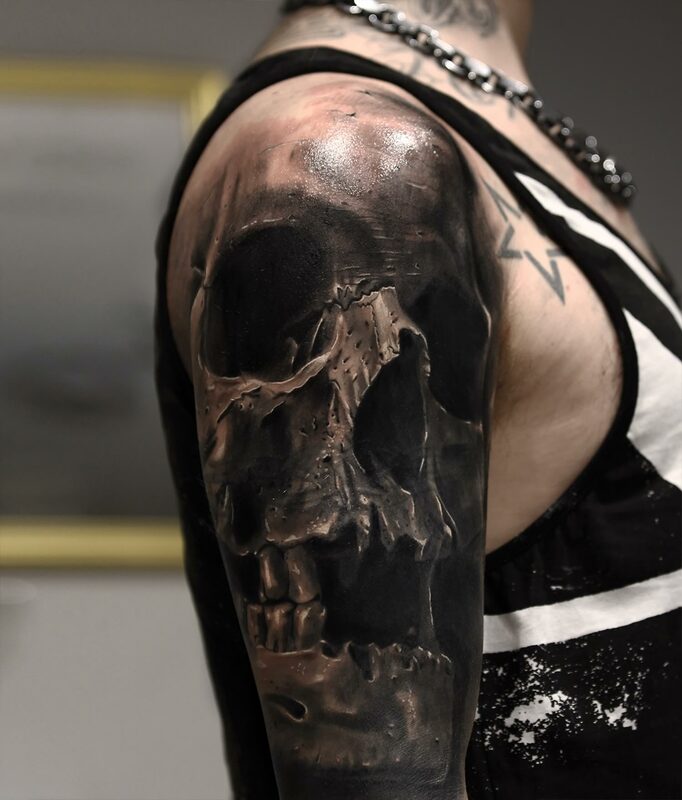 A sense of scale gives this skull maximum impact. 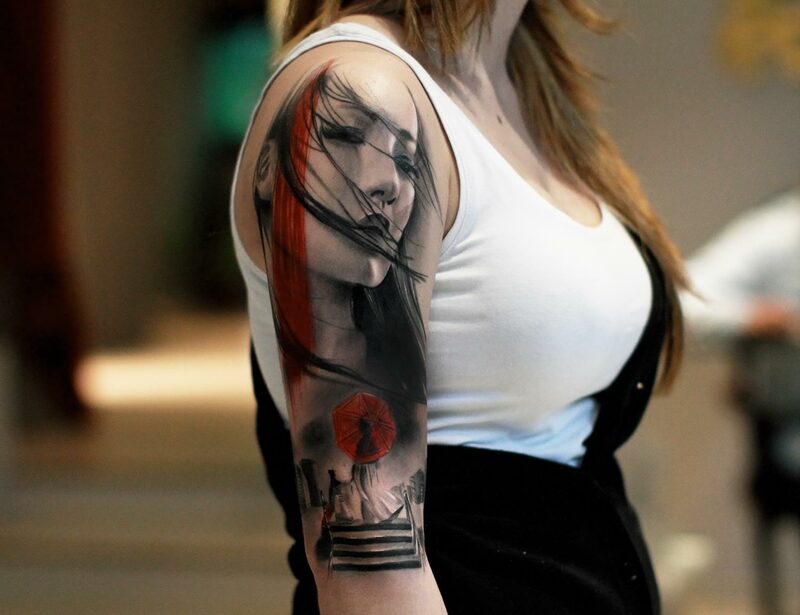 Do you have any role models, any artists (tattoo or otherwise) you look to for inspiration? Primarily the model that inspired me is my father, for his dedication and perseverance in everything he’s ever done, and that’s the same that I have today. As far as the artistic discourse, I always loved realist painters, and my main reference model is Caravaggio. 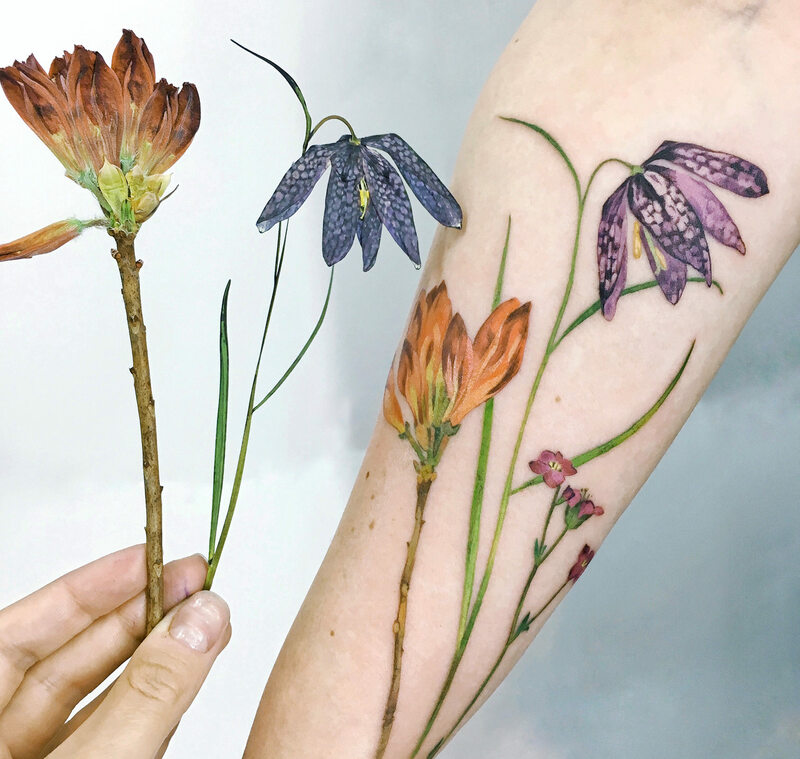 Dynamic use of space makes this skin canvas come alive. Your studio features classical Italian art and your videos use opera as a soundtrack. 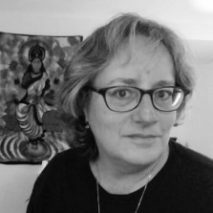 How much do you feel your cultural background informs your work? My country has influenced me a lot. I’m Italian and I’m proud of it. I love all of our artistic background, both at the level of classical art (paintings, sculpture, architecture) [and at the] music level, it is a fundamental part of my work. It contributes, indeed is fundamental, to my work. It would be impossible for me to work without music in the background. 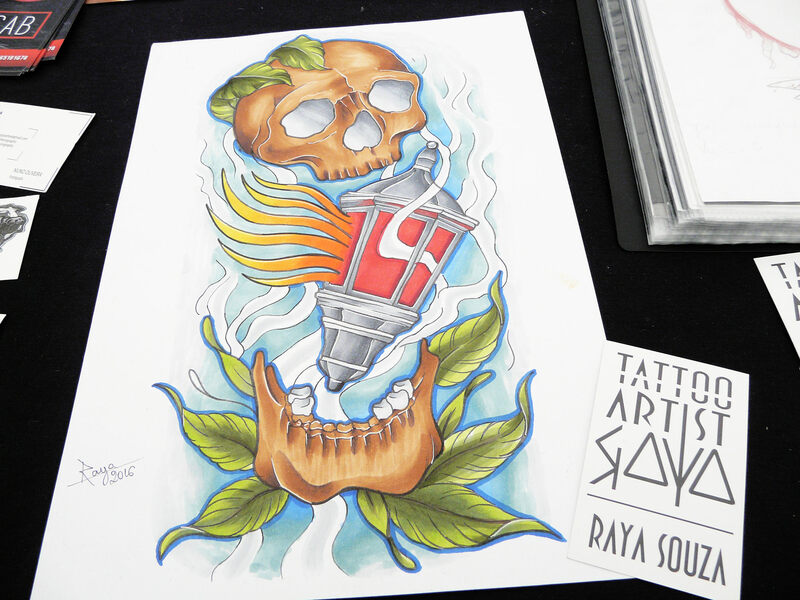 What do you feel you can accomplish by tattooing that you can’t by painting or drawing or any other art form? 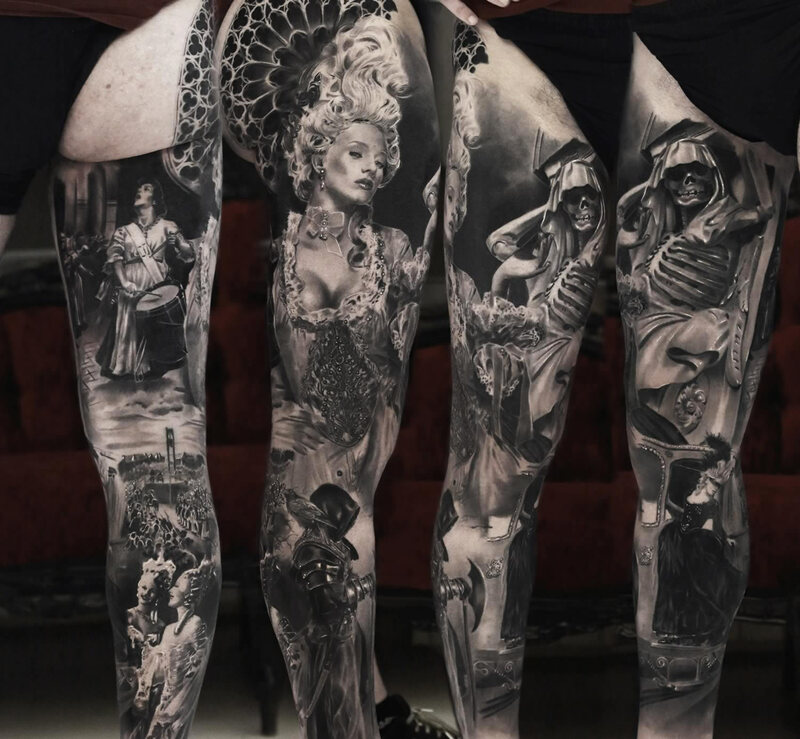 Unlike the other works of art that are locked up in museums and galleries and are therefore reserved for a limited number of people, the tattoo is a work that goes around the world, free and accessible to all. Many [more] people have possibilities to see them than those that are closed and static. It is literally a work of art in motion. In Fiato’s hands, one sleeve tattoo can tell an entire story. 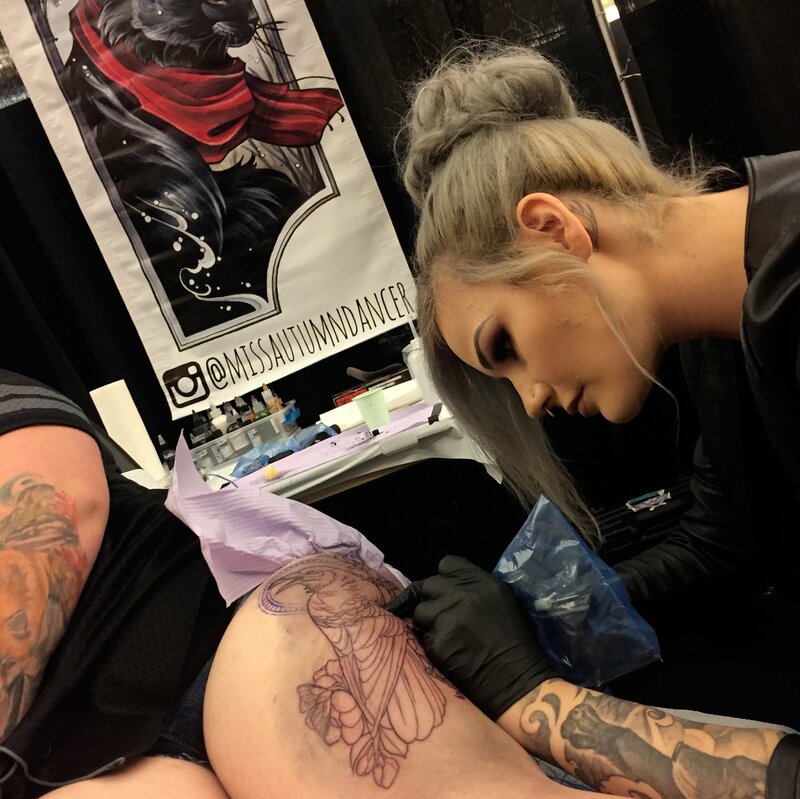 When you’re designing a tattoo, how much of the process is the client wanting a certain image and how much is you, the artist, making creative choices? 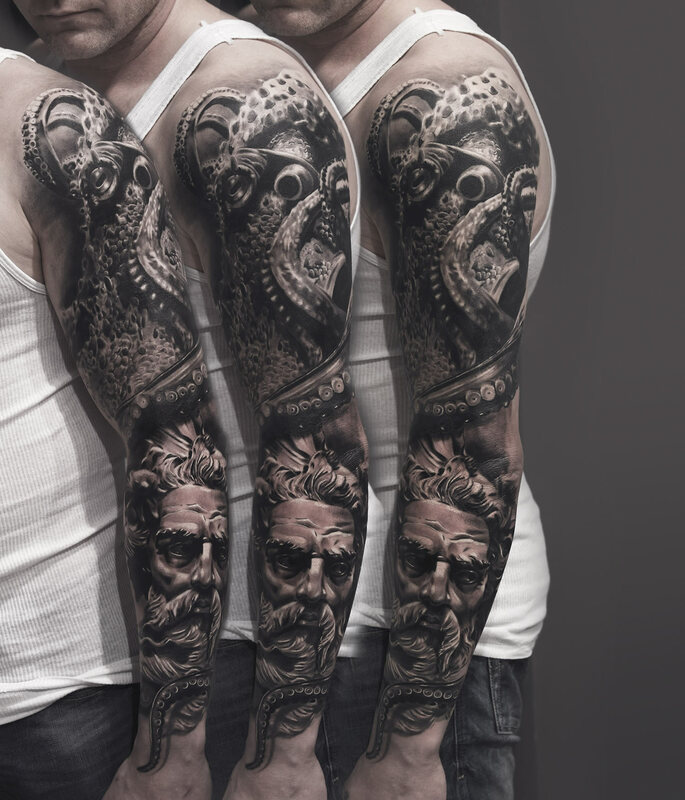 Hardly at all now, because I ask my customers just for an idea or a feeling, then I give my vision of what they wish to represent, working almost exclusively with international tattoo collectors. I don’t accept special impositions on my work. Those who come to me, it’s because they want my exclusive work. I never replicate my pieces, but I create something unique and exclusive to each one. Is there anyone you wouldn’t tattoo, or anyone you’ve had to turn away? I’ve often refused to do tattoos to some people because, as I said before, I don’t like to accept impositions or restrictions on the design to be realized. Small portraits pack just as much punch as big ones. 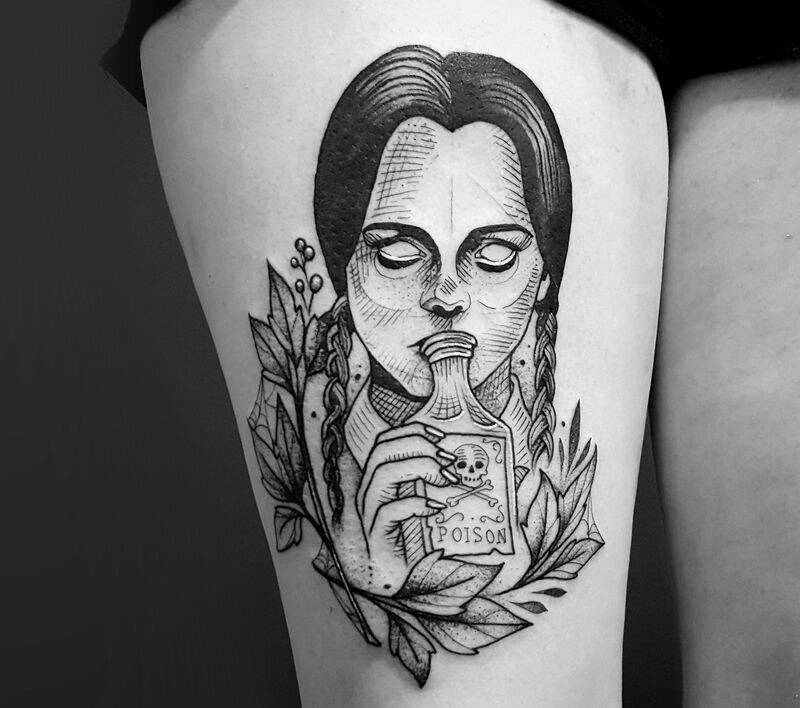 Has anyone asked you to tattoo a part of the body you didn’t want to tattoo? Fiato doesn’t shy away from bold religious images. 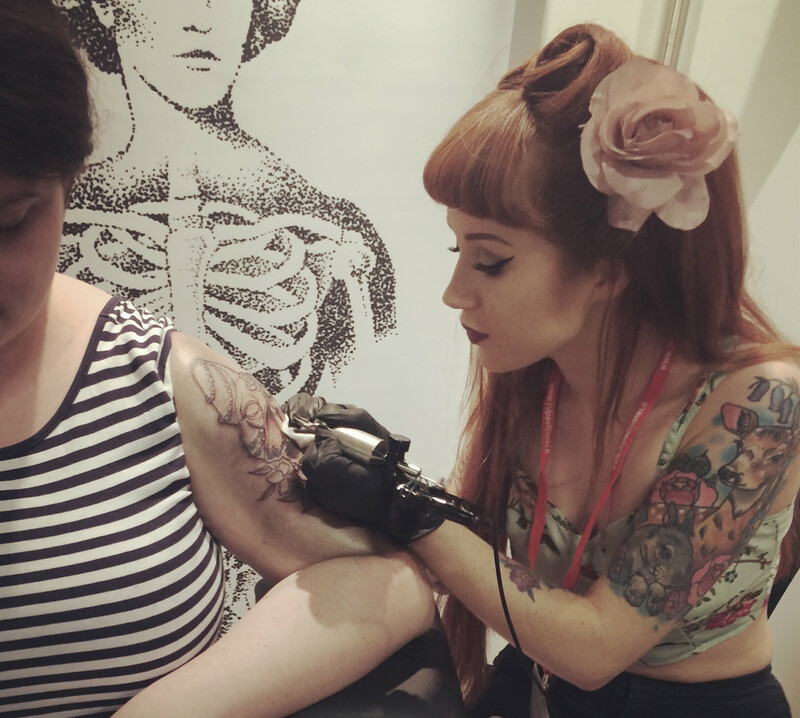 What is your response to critics who say tattooing is not art? I believe that art is an alternative way to express your feelings and emotions. Whether it is on a canvas, on leather, or behind the lens of a camera, to me there’s no difference. 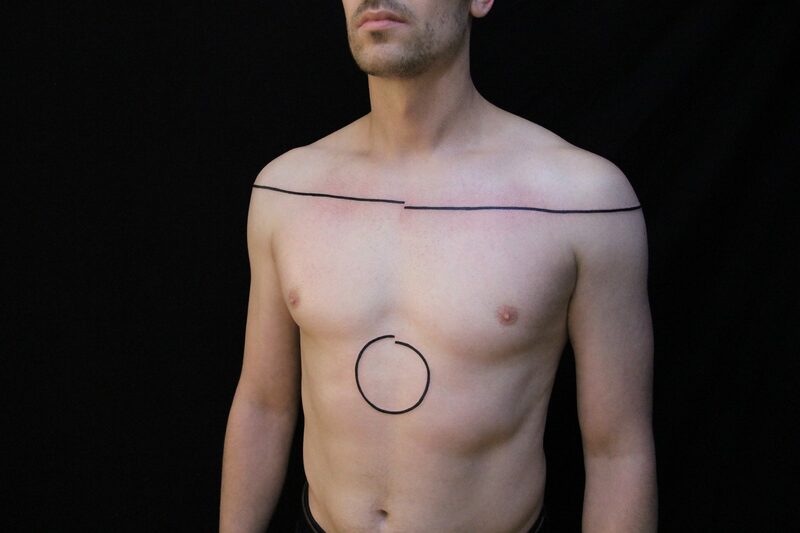 So, advice I could give the so-called critics is to have a look around, not tied to the old idea of “sailor tattoos,” and see how it has evolved in the world. Do you see yourself continuing to specialize in hyperrealism, or are there other forms you want to explore? I love tattoo in all its forms. Of course, now I have the opportunity to only dedicate myself to this style and I believe, having arrived at a certain level, it’s natural to be dedicated to a specific style and give your best to improve in the style chosen. It takes a meticulous artist to consistently create this kind of detail. What do you see in your future? What else would you like to accomplish as an artist? I would like to expand and transmit what I know to other artists. I would like to open another studio and do what I already do now, to take talented artists and make them grow day-by-day with my teachings and my supervision. Follow Silvano Fiato on Instagram and Facebook.